I’ve been on vacation after the sudden passing of my mom so I’ve been a bit quiet lately. But I’m back and I have to say I loved this novel, the first in the The Winner’s Trilogy by Marie Rutkoski! SUMMARY: Winning what you want may cost you everything you love. They were never meant to be together. As a general’s daughter, seventeen-year-old Kestrel enjoys an extravagant and privileged life. Arin has nothing but the clothes on his back. Then Kestrel makes an impulsive decision that binds Arin to her. Though they try to fight it, they can’t help but fall in love. In order to be together, they must betray their people . . . but to be loyal to their country, they must betray each other. WHAT I THOUGHT: The world the author creates is one where one people have conquered another and turned their captives into slaves. This situation lasts for a decade, but when the captives rise up and retake power, everything turns upside down. I loved how the author helped the reader empathize with the captives…how would it feel if your freedom was suddenly taken away and you were made a slave to the victor. Would you swallow your pride and suddenly serve the needs of your captor? Would you do even the most menial of tasks? And for a decade with no promise that things will ever change? This is the situation Arin finds himself in, a slave of the victor, bought and sold at the whim of his captor. Kestrel, a young lady of the victor’s side buys him on an impulse but never treats him disrespectfully as some. Their relationship grows and love takes root. But things are too good to stay as they are (especially to keep readers engaged), and when Arin leads a rebellion he helps topple the rule of his people’s oppressors, throwing Kestrel into his possession…how the tables are turned and she detests it. The author does a great job at keeping the opposite and colliding worlds before the reader and having us “feel” the other’s position. As for characters, Kestrel is a dynamic and growing heroine. The author starts her as a naive socialite and through consequences of her own making, she must learn from her mistakes and ignore her peers and society’s expectations as she struggles to create a path for herself and her future. Arin is also a dynamic and engaging character. I loved how the author slowly reveals his past, helping us see and feel how he must have felt being dehumanized by his captors. I particularly loved the scene where we find that Ibex’s house was his before the takeover…oh feels… What a great character! And then there’s the swoon-worthy quotient…this book is slow building in a relationship that readers are sure to love. I can’t wait to see how it is deepened and grown in the next book. 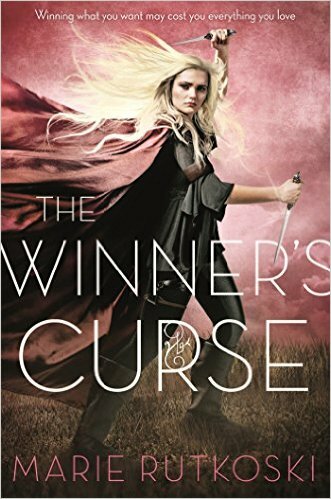 Buy The Winner’s Curse on Amazon! IF YOU ENJOYED THIS POST, be sure to scroll to the top of this page and sign up to be notified the instant a new post goes live. Also, leave a comment to let me know what you thought. I’m sorry to hear about the sudden loss of your mother and hope you will find comfort in the memories of happier times together.